It has unfortunately become a common norm to doze off the minute the flight attendant begins the safety instructions. But if you are flying with this air hostess in Southwest Airlines, there is hardly any way you may miss the safety rules. 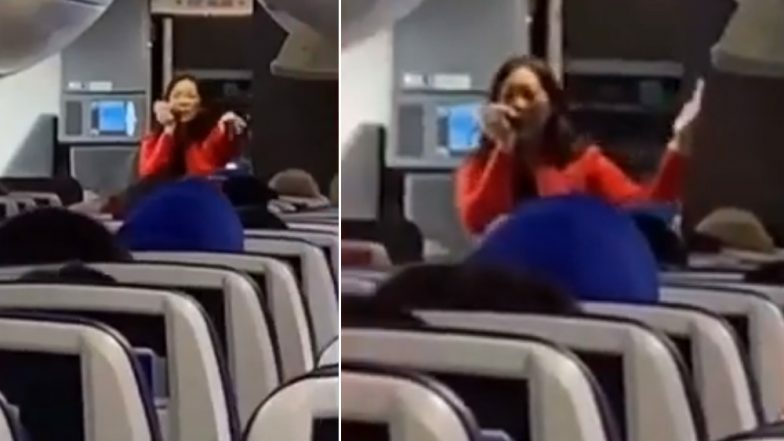 With an aim to grab the passengers attention, a flight attendant named Adele raps the safety instructions. Yes, she raps it! And it doesn't end there, she involves her audience too. A video going viral on social media shows Adele rapping while passengers beatbox catching the rhythm. Some can also be seen clapping encouraging her rap song. In the clip, she can be heard saying, "Stomp, stomp, clap, stomp, stomp, clap... My name is Adele and I'd like to say, we are on our way. So fasten your seat belts, make'em nice and tight. You better do'em good, we're gonna check if they're right." She adds singing, "Seat back and trays, locked and upright. Pretty soon the ground will be out of sight. Laptop and computers powered down and stored away. Are you ready to go? What do you say? Welcome aboard, SWA." Turkish Airlines' Pilot Surprises His Teacher Who Was Flying With Him; Watch Heartwarming Video. The whole seems to be enjoying the rapping session and even rapped alongside. The video of Adele was captured during a flight from Los Angeles to Utah. Meanwhile, we hope more flight attendants take inspiration from Adele. Earlier this week, video of an employee with Spirit Airlines was seen dancing with passengers at the Myrtle Beach International Airport in South Carolina after their flight was delayed. The video of people dancing at the airport had gone viral on social media garnering praises for their employee.